Home > Resources > Recover Android > How to Recover Lost Data from Android SIM Card? Generally speaking, SIM card is a place that stores the phone contacts and text messages and the two types of phone data is very significant for every phone users. However, for unexpected reasons, you might delete those important contacts and text messages from your Android SIM card owning to human operating error or phone problem. Losing contacts and text messages from Android SIM card is a big headache because it will cost you a lot of time and energy to get all the phone numbers one by one, let alone the SMS messages. 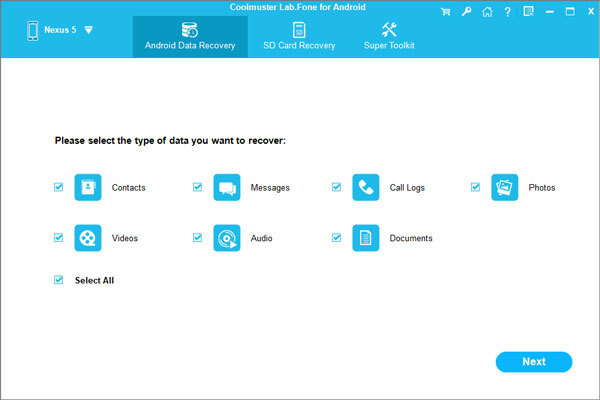 Now, you can free up your hands by using professional Android data recovery like Coolmuster Lab.Fone for Android software. With it, you are able to scan and access your Android SIM card, preview all the lost contacts and text messages, and then selectively to recover them back with simple steps. This Android data recovery software is 100% clean and easy to use. And not only contacts and text messages, you can also use it to retrieve deleted and lost photos, videos, music and documents from Android phone and Android tablet. 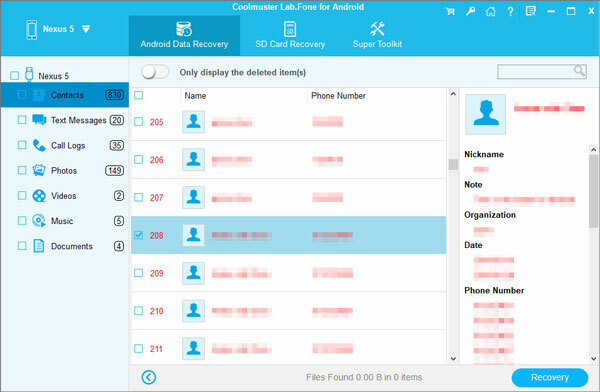 Note: Before launching this Lab.Fone for Android software to recover deleted contacts and text messages from Android SIM card, you need root your phone first. Run this program on your computer and then connect Android smart phone to it via a USB cable. The software will ask you to open USB debugging on the phone once it detects the device. Just follow the instructions prompt on the program window to do that and then choose "Allow" button. This Android Data Recovery will automatically scan all files on your Android phone. Soon you can get all files that are categorized on the menu. Click "Contacts" and "mESSAGE" folders and all your lost and existing contacts and text messages are shown here. Just preview and select those contacts and text messages you want to recover from the Android SIM card, then, give a hit on the "Recover" button and you will achieve to retrieve lost Android SIM card data at once.